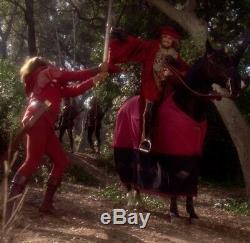 A costume featured in the Star Trek: The Next Generation episode'Qpid' where Captain Picard and his away team are taken off to a real live Robin Hood adventure by Q (who plays the wicked Sheriff of Nottingham)... Just like a holodeck adventure, but with the safety off. 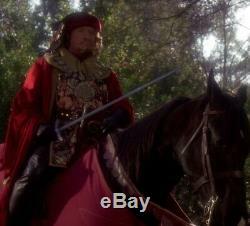 Sir Guy of Gisbourne (Clive Revill) was featured in the Star Trek: The Next Generation episode Qpid in which Q (John de Lancie) transported the senior officers of the Enterprise-D into a recreation of Sherwood Forest to teach Captain Picard (Patrick Stewart) a lesson about love. 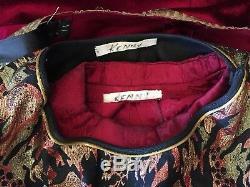 This costume was made for wear by Revill's stunt double (Kenny Lesko) and includes a crimson patterned shirt with a zip up the front and snaps at the cuffs. The tabard is patterned red and gold on a black background with a stylized slit up the front. There are also two Velcro patches on the front. 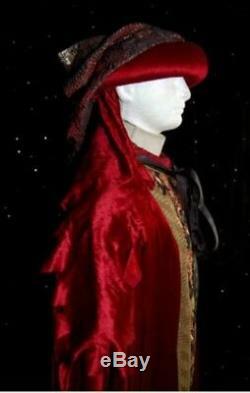 The corresponding crimson velvet robe has long sleeves with pleats and gold ribbon trim. The sleeves taper into points and have a castle top edge as does the bottom edge. 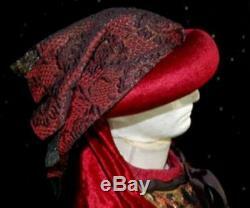 The accompanying hat has a padded crimson rim, a padded crimson tail and patterned red, black and gold top section. 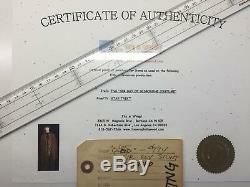 It comes with the original TNG wardrobe tag. 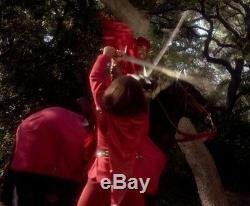 This is a Screen Used Costume, please see screen caps in the listing. 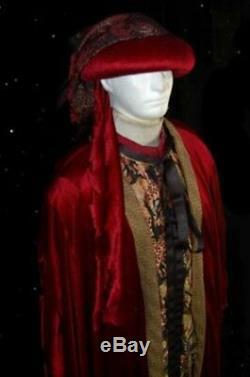 This costume came from the Its A Wrap Auctions and it comes complete with the IAW COA. Thanks to Trekcore, Wiki and Memory Alpha for the background info. 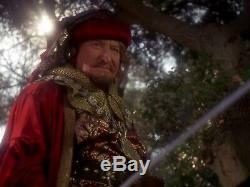 The item "Star Trek TNG Qpid Sir Guy Of Gisbourne Stunt Screen Used Costume Robin Hood" is in sale since Thursday, August 9, 2018.